Often, students say they picked a college for its beautiful campus or extracurricular activities. Jenea Adams is a bit different: she chose the University of Dayton for the Stander Symposium, a once-a-year opportunity to present undergraduate research to the campus community. 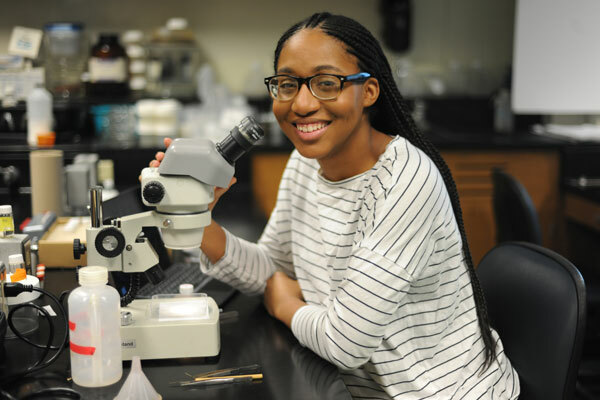 Adams, a junior biology major from Cleveland, is an environmental biology research assistant and undergraduate project leader in the lab of Ryan McEwan, associate professor of ecology and director of the environmental biology program. She is presenting at Stander for the first time this year; her project explores how the invasive shrub Amur honeysuckle impacts aquatic macroinvertebrates — tiny, water-dwelling organisms — in the Dayton area. The project began four years ago with lab members exploring different parks and reserves in Dayton, locating streams and qualitatively rating the amount of Amur honeysuckle into three categories: reference, moderate and heavy. The team then went back to the streams to collect the aquatic macroinvertebrates and brought them back to the lab for analysis. Adams’ current contributions to the ongoing project include conducting data analysis by using computer tools to sort through data, finding trends and drawing conclusions. She previously assisted other lab members in preparing the macroinvertebrates for analysis.